Most of the Jaspi boilers are fitted with an internal cooling coil. This coil is designed to cool down the boiler in case of overheating when burning solid fuels. The STS 20 valve is designed to fit the Jaspi boilers and will let through cold mains water through the boilers cooling coil in case of overheating. The valve is equipped with a dry sensor pocket and thermal probe which is connected to the body of the STS valve by a 1300mm thermocouple cable. STS valve is connected between the mains cold water feed and the boiler cooling coil. in line on a mains cold water feed. 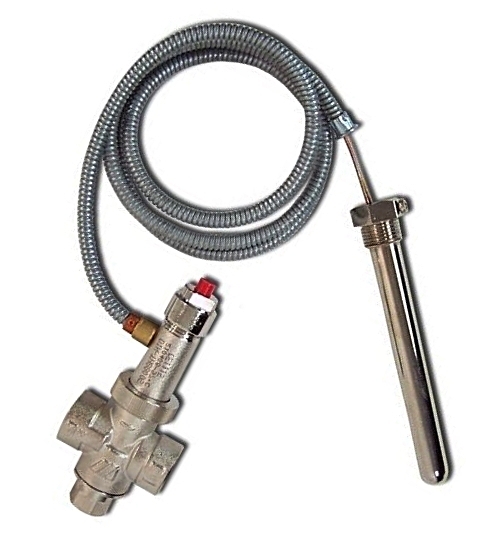 The valve opens automatically to release cold water in to the boiler cooling coil when the water temperature in the boiler exceeds 97 degrees. As the cold water flows through the cooling coil, the cold water absorbs the heat and cools down the boiler. The hot water is then discarded safely to the drain or outside. The advantage of using this type of boiler cooling is that the pressure within the boiler & heating system is maintained and no water is lost within the system. The thermal safety is valve required for temperature protection in closed hot water heating systems up to a maximum 93 KW power output. It is an independent safety valve, which opens when the water temperature within the boiler reaches 97 ° C.
The internal sealing piston / valve is driven centrally preventing the risk of jamming / stalling. No housing parts are made of plastic, and are therefore resistance to high temperatures. Suitable for temperatures of up to 125 °.